Energy Conservation Insulation has over 40 years of combined insulation experience, as well as extensive knowledWill Lebeda ECI Insulationge of energy conservation techniques. No matter what the project is, from a remodel to building a custom eco-friendly home, we have the products and the knowledge to answer all of your insulation needs. Our fiberglass installation team has over 40 years of combined experience. With this much knowledge and field experience, you can be rest assured they know what it takes to get the job done accuratley the first time. Our spray foam team, coming from over 12 years experience of working with foam products, we know the building codes, and the ins and outs of what it takes to put the right product just where it needs to be so you can benefit the most from the application without spending the most. 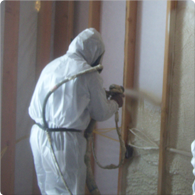 ECI prides itself in being a leader in insulation techniques and applications, as well as our World Class Service we provide to our clients. We are passionate about providing our clients with the very best, eco-friendly products that are available today as well as providing years of experience to be able to provide a solution to fit any project no matter how big or small. We currently are the provider of insulation services to many respected names in residential and commercial construction. These include Builders, General Contractors, HVAC companies, Architects and Engineering firms who have hired us and stay loyal because we have earned their trust and confidence in our level of service. We are more than happy to provide a list of references at any time upon request. We are proud to service Central Oregon, Eugene, Salem, Klamath Falls, John Day and the Portland Metropolitan areas. Thank you for your interest in ECI and we look forward to earning your business. We just received a great letter from Newberry Habitat for Humanity thanking ECI for our quality of workmanship. Last house was 3.14 ACH! Visit our website to see how ECI can save you money every month on your energy bills. We are Oregon's go to insulation contractor!